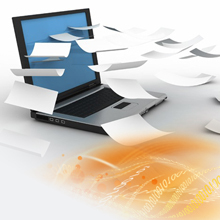 Does your business processes still require customers to fill out paper forms? If your answer is yes, we have good news for you. It is estimated that more than 95% of businesses still use paper and print somewhere in the customer onboarding cycle. Let us energise the process and impress your new prospective customers. Scan is attached to email and email is sent. Once this document is received back, the information now needs to be captured and verified and often printed, signed, scanned and emailed again. The customer is directed to an online onboarding form. The customer electronically completes the form, attaches any accompanying documentation. All information is electronically written to your ERP/ ECM/ CRM or other system for automated processing. No printing, no hand written documents, no scanning no capturing and no time wasted. Please contact us on 011 516 9400 for more information or to book a product demo. This entry was posted in Blogs, pbDigital, PBSA, pbVerify and tagged digital onboarding, onboarding by Bonnie van der Merwe. Bookmark the permalink.